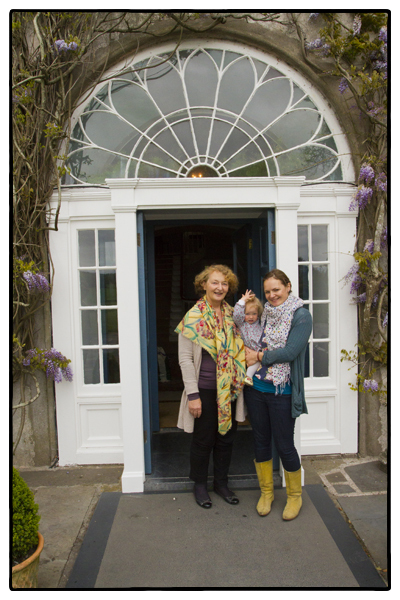 Three generations of the Allen family at Ballymaloe. That’s Hazel (inn keeper), Ruby (undecided), and Roisin (Hazel’s youngest daughter). Photo by David Lansing. So what’s a Ballymaloe? It’s a country inn. And a restaurant. And a cooking school. The original house dates back to 1450 (although it was recently remodeled in the eighteenth century) and is set in the middle of gorgeous Irish countryside just a mile or so from the little fishing village of Shanagarry, about half an hour south of Cork. The whole thing is run by the Allen family. One runs the hotel, another the cooking school, and so on. As you walk around the property you’re bound to run into one Allen or another pouring tea, feeding the chickens, or stumbling along in the lobby (that would be Ruby, the youngest Allen, who just took her first steps two weeks ago but seems bound and determined to get out there and help out along with the rest of the family). Yesterday morning when we were at breakfast, a lovely middle-aged woman came by the table and asked us if we’d like some fresh cream on our porridge. The thick yellow cream was in a Mason jar. “It’s from this morning’s milking,” she said. She wasn’t kidding. She dribbled some of the cream over my porridge and then on my fresh strawberries (from the garden), and eventually on my still-warm scone. This was Hazel. Who is basically in charge of the hotel end of things. I thanked her for the fresh cream and then she was off. To offer cream from cows milked less than two hours ago to the other guests. 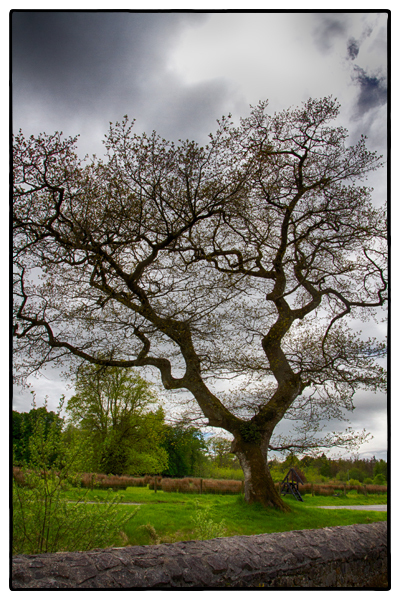 A fairy tree in County Cork, Ireland. Photo by David Lansing. The implication was that I could ask Mr. Daly what those complications were and, no doubt, here about them all the way to Ballymaloe, or just tell him it wasn’t a problem. I told him it wasn’t a problem. At one point on the drive we got a bit lost and Mr. Daly pulled out the map scrunched in beside his seat and asked me to find the highway from Midleton to Shanagarry, which is the closest little village to Ballymaloe. I told him it was R629. Or R632. I told him either one would get us there. And just at that moment, Mr. Daly saw a wee sign pointing towards Shanagarry and that’s the road we took, whatever it was. Here’s the thing about Ireland: Everyone gets lost. Even professional drivers who’ve been driving these back roads for 20 years, like Mr. Robert Daly. The thing is that most of the roads are just narrow country roads and every few miles there’s a Y in the road and seldom any signage so you tend to wander off one direction, realize it’s not right, and then backtrack and take the other fork in the road. As long as you’re not in a hurry (and we weren’t), it’s a lovely way to travel. And it lets you see a bit of the countryside. The endless green fields, the black-faced sheep, the fairy trees. Mr. Robert Daly pointed out several of the latter to us. And what, you may ask, are fairy trees? They’re lone trees, usually on a mound in the middle of a field, that, legend has it, is home to the little people. And out of superstitious belief, they’re seldom if ever cut down. Because who would want to destroy the home of a leprechaun? 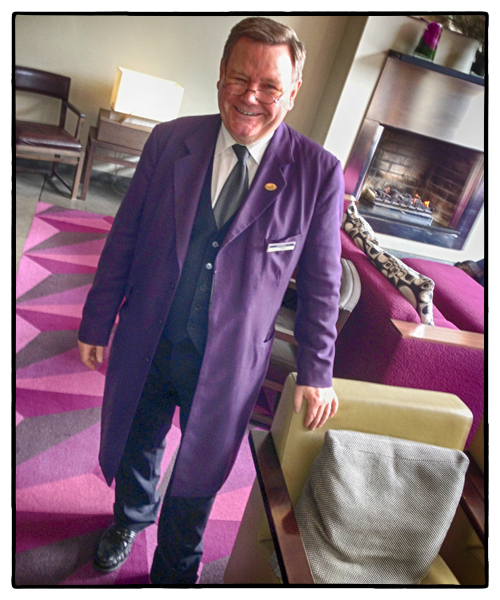 Tony, the concierge at The Fitzwilliam in Dublin. Photo by David Lansing. When we arrived in Dublin arrangements had been made for a driver to pick us up at the airport. My instructions said we were to “Meet driver at Yellow Structure outside baggage claim.” The Yellow Structure being a very tall and obvious piece of abstract art. So we collected our bags, found the Yellow Structure, and waited. But our driver never showed. This has been bothering me ever since so this morning when I came down to breakfast and saw Tony, the concierge at The Fitzwilliam, I asked him if he’d ring up the company that was supposed to collect us and find out what happened. Tony was happy to oblige. Long pause. Tony rolls his eyes a bit and then covers the phone with his hand. Before I can say anything, Tony is back on the phone with the idgit explaining that Mr. Lansing was most assuredly at the Yellow Structure as instructed waiting for almost an hour for a driver who, no doubt, lost track of time while enjoying a second or third Guinness at the pub and it’s a shame, really a shame, that they even license businesses such as theirs because don’t they know it gives a black eye to all of Dublin and surely he, Tony, will never recommend them to any guest staying at The Fitzwilliam. And then he hangs up. I think Tony and I are going to be great friends during our stay here. 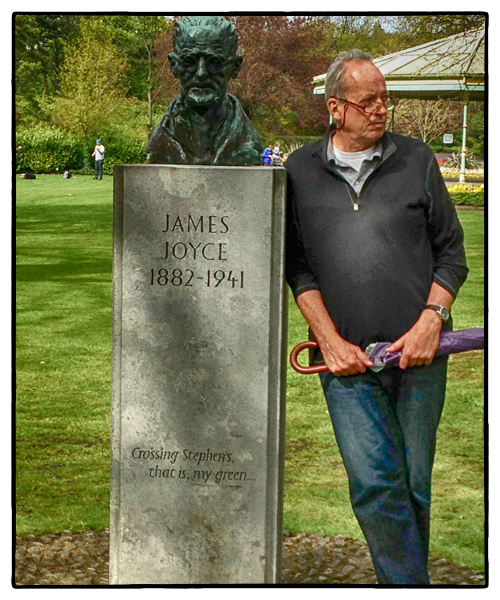 Hanging out with James Joyce in Dublin. What I’d like to do, if you want to know the truth, is sleep away the afternoon on my purple bed in The Fitzwilliam Hotel but I know that would only make my jet-lag worse. Better to go for a walk, get a little fresh Dublin air. And I know just where to go. First to visit James Joyce in St. Stephen’s Green and then on to Davy Byrne’s pub for a beer. Tony, the concierge at the Fitzwilliam, intercepts me before I can make it out the door. “You’d best be takin’ this wid ya,” he says, handing me an umbrella. I protest that the sky is blue. “Sure it is,” he says. “But this is Dublin. The weather will change in an hour.” So I take the umbrella, though I’m sure I won’t need it. The bronze bust of Joyce is no more than a block away. I approach the old man with a smile, happy to see him again. “How are you then?” I ask. It seems to me that Dublin could do better by Joyce than the modest little bust that goes mostly unnoticed by strollers in Stephen’s Green. You can’t help but feel Joyce is getting a little shortchanged here, particularly when you admire the brilliant slumping figure of Oscar Wilde not far away. But maybe Joyce would prefer it this way. At least they don’t call him the Fag on the Crag. From here it’s just a few block up Grafton Street to Davy Byrne’s where Leopold Bloom dropped in for a gorgonzola and mustard sandwich in Ulysses. The place has changed, obviously. They’re no longer serving the gorgonzola sandwich and the long wooden bar is long gone. I order a smoked salmon sandwich and a Smithwick’s. The beer is thick and creamy and goes well with the smoked salmon and dark crusty bread. The perfect start to a stay in Dublin. 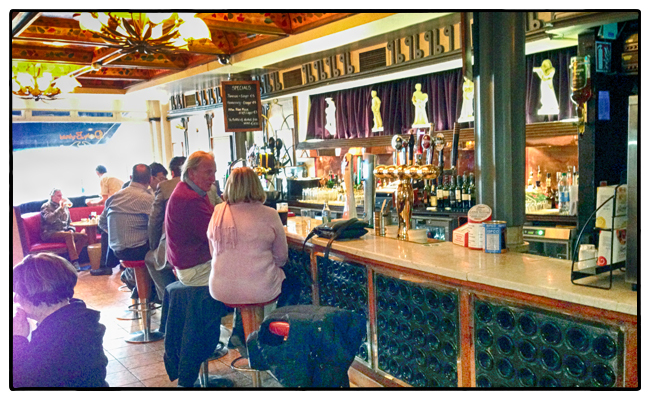 The bar at Davy Byrne’s in Dublin. 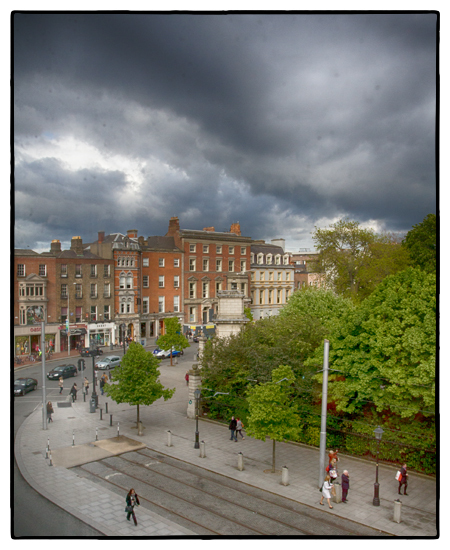 The view from my room at The Fitzwilliam Hotel in Dublin. Photo by David Lansing. A full day of travel yesterday and then I’m in Dublin, a chatty taxi driver explaining to me why he has to take the long way around St. Stephen’s Green to get me to my hotel, The Fitzwilliam. “They make us go this way,” he says as we pass Trinity College and then the bronze replica of Molly Malone—the tart with the cart, as Dubliners call her. I hum the song to myself: In Dublin’s Fair City/Where the girls are so pretty/I first set my eyes on sweet Molly Malone/As she wheel’d her wheel barrow/Through streets broad and narrow/Crying cockles and mussels alive, alive o! And then we are here, at the Fitzwilliam, a doorman in gray top coat and hat rushing out to open the taxi door. And it hits me with sadness and remembrance, this Dublin smell: wet, dusty, green, with a tinge of smoke painted over everything. Minutes later I’m in my room, which is too hot and closed up. I push open the window, stick a hand out just as it starts raining, look out over the fullness of Stephen’s Green, the boiling black clouds, Dubliners in the street hustling about, dashing to get out of the late May downpour. I’m home again in Ireland.